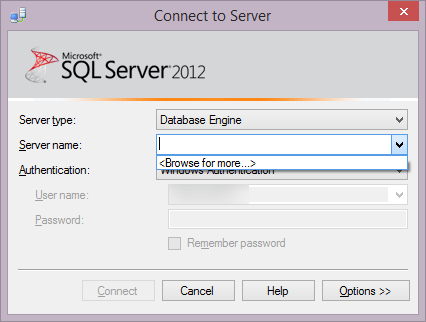 Having to install new laptops, re-install old ones, configuring virtual servers or whenever you get the opportunity to install SQL Server from scratch, you always end up with an empty list of servers, when you try to connect through SQL Server Management Studio (SSMS). There is a way around this minor, but still sometimes very annoying issue. The information is stored in one file only, on the profile you are currently logged on to. So copying this file, from an existing setup or a shared repository (like SkyDrive or TFS), to the new environment will bring you up to speed really quick. I tend to use registered servers more than the server list in that drop-down. Registered servers can be exported and imported easily. If you want to share you registered servers with all your team you can also set up a CMS and register your servers there. Great Tip, its always annoying having to set it all up again.